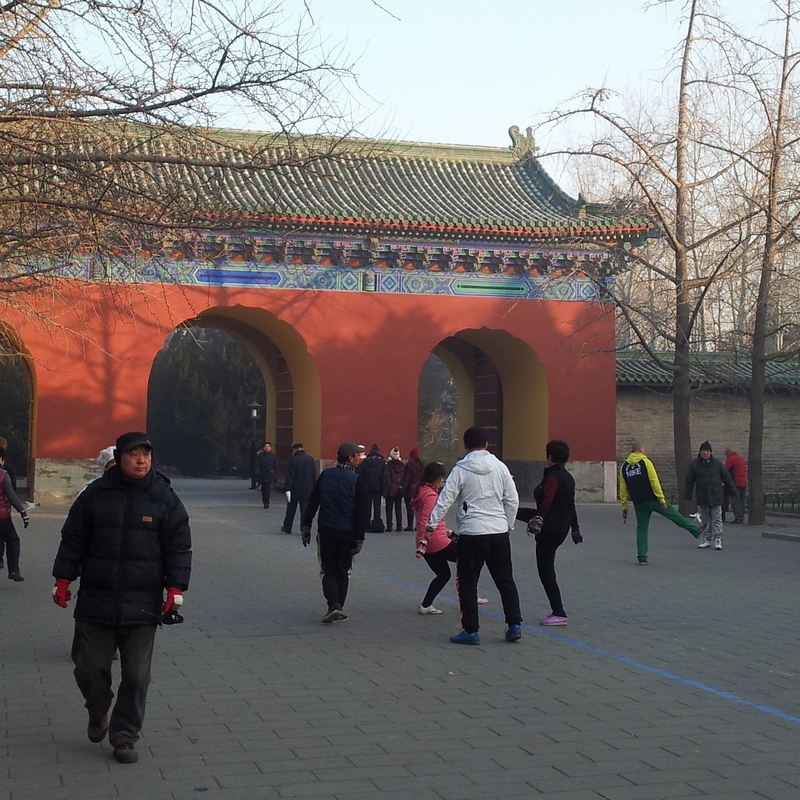 22 hours in Beijing: long enough to know I want to go back. | Where's Zoe now? 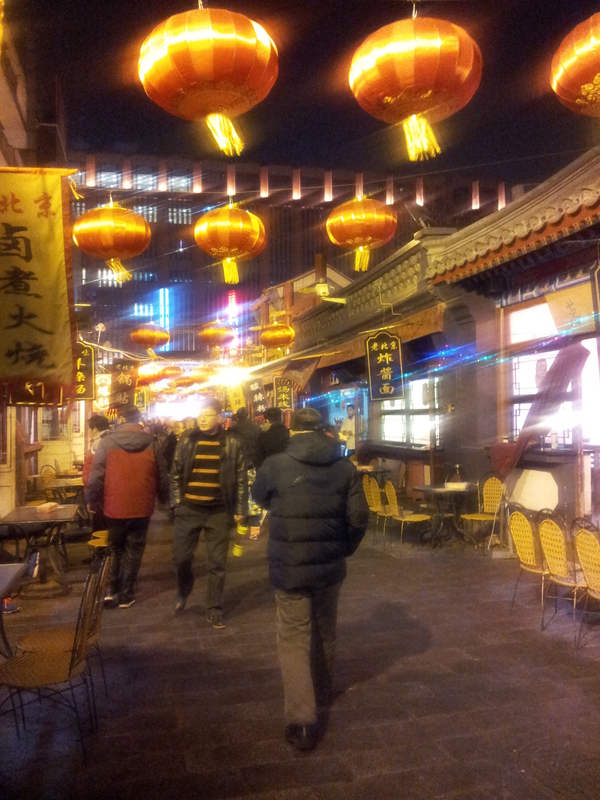 22 hours in Beijing: long enough to know I want to go back. So. I got distracted by airfare search engines and now I have a ticket with Air China, […] Singapore-Milan via 22 hours in Beijing. In January. When the smog is worst and it can be -20 [Celcius]. I can’t say “What was I thinking? ?” because I know exactly what I was thinking: This will make a great story. Those facts about the pollution and weather? I looked them up after making the non-refundable booking. To give myself credit, I did look into visa requirements before putting down the money, but that was as far as I got because as soon as I discovered China offers visa-free entry for up to 72 hours as long as you enter, leave and stay in the same city, I was hitting the “buy now” button. I think I see why some of my friends think I’m an impulsive traveller. So I was apprehensive as I got on my flight from Singapore to Beijing. What if my clothing wasn’t warm enough? What if I’d misunderstood the visa rules and couldn’t leave the airport? What if I lost the vital piece of paper with the address of my hostel written in Chinese characters? Well, score 1 for Team Impulsive Ticket Buying, because I had a great time. Things started looking good as soon as I landed and I realized how fortunate I was with the weather. It was a sunny winter mid-afternoon, a gentle breeze, and the infamous pollution looked remarkably similar to the haze you get in many Italian cities 1. I’m sure it’s not always like this, but I was thankful it was. I was concious of my limited time, so my main priority was Eat All the Food, while fitting in as much sightseeing as I could around this primary goal. So my first move, once I’d dropped off my stuff at my hostel, was to get some dinner. At the night market at Wanfujing, I decided against fried scorpions on a stick in favour of the more Australian-palate-friendly grilled lamb (also on a stick). Tasty and with just the right amount of chili powder for a cold night. Porta Palazzo needs an entrance like this. I was pretty full after the lamb, but the market was warmer than the surrounding streets due to all the cooking going on, so I hung around and had a yoghurt drink and the most delicious savoury pancake I’ve ever eaten — like this, but the guy in the market was much more skilled than the guy in the video. I also considered some dumplings, but I just couldn’t make room, so I decided to leave that for the next day. Most of my photos turned out like this — I blame grease in the air from all the frying going on. As well as the outdoor food stalls, there were indoor stalls with tables set up like a food court, and other stalls selling mostly souvenirs, the sort of knick knacks that look so enticing when piled up together but which you know would look sad and tacky sitting by themselves in your house. 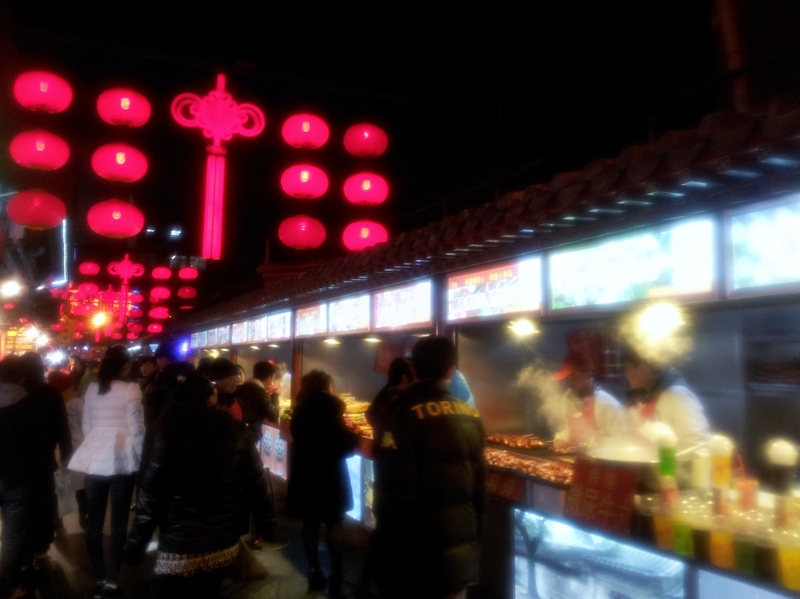 Quite a few stalls had speakers with loud Chinese pop music going, which added to the atmosphere. No serious fine dining here, but it was great fun. More decoration ideas for Porta Palazzo. Normally I’m a homebody when I travel and after dinner I go straight back to my room to read a novel or putter about on facebook, but the clock was ticking on my stopover so I pushed myself to stay out. 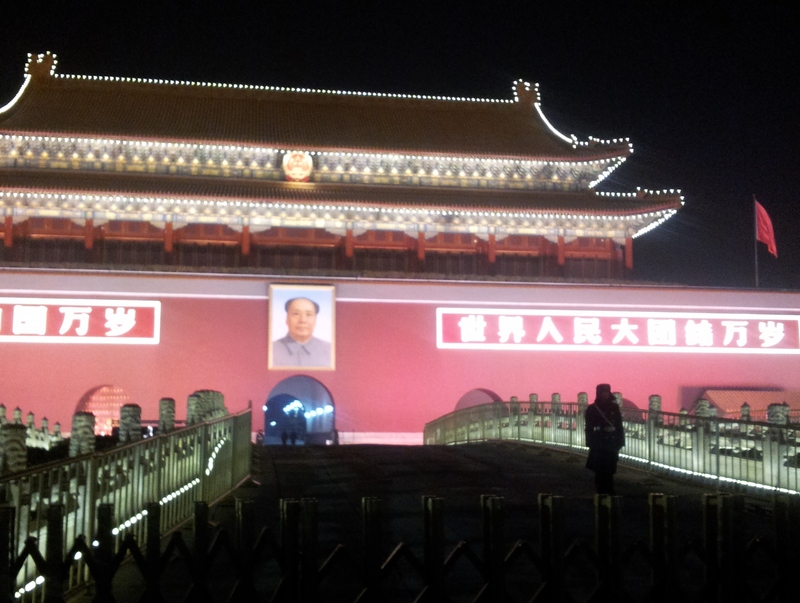 I headed to Tiananmen Square for a post-dinner stroll under the watchful gaze of Mao’s portrait, a handful of guards, and a whole heap of cctv cammeras. After the cheery busyness of the market, the huge concrete square, nearly empty but still noisy from traffic on the road running through it, was quite the contrast. I didn’t stay long. The next morning I had to make some hard choices about what to do with the hours left to me. Beijing is huge (understatement!) and there are so many amazing options. 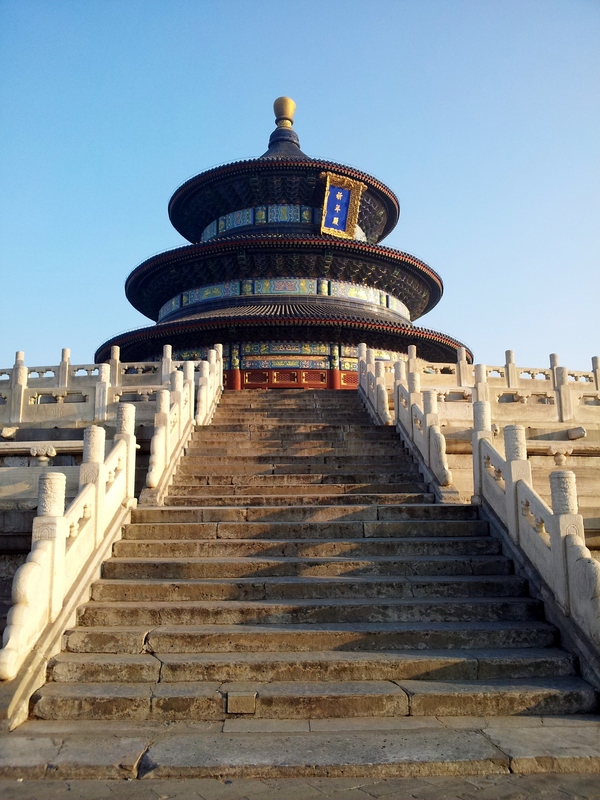 I decided on the Temple of Heaven park, which I went to as soon as I got up. I am obviously a decadent westerner because I was all rugged up against a chilly morning and considering finding somewhere indoors to go instead; meanwhile the locals were out doing tai chi and playing badminton and hackey sack. Like in the market the night before, there was plenty of loud music and the atmosphere was sociable. Those are actual adults playing hackey sack. Good thing we didn’t know in highschool that our activity of choice was shared by middle-aged Chinese women. I wish I could tell you more about them but I only had a quick look around one of the complexes before heading back to the subway, because I was on a misison for dumplings. (I think dumplings are a legitimate excuse for failing at blogging, yes?) Lonely Planet recommends Dūyīchù and I’d say that’s a fair call. It’s well set up for tourists with a picture/English menu available, but importantly, the dumplings are delicious. They made for a great end to a great trip, which was far too short. I have got to do this again some time. 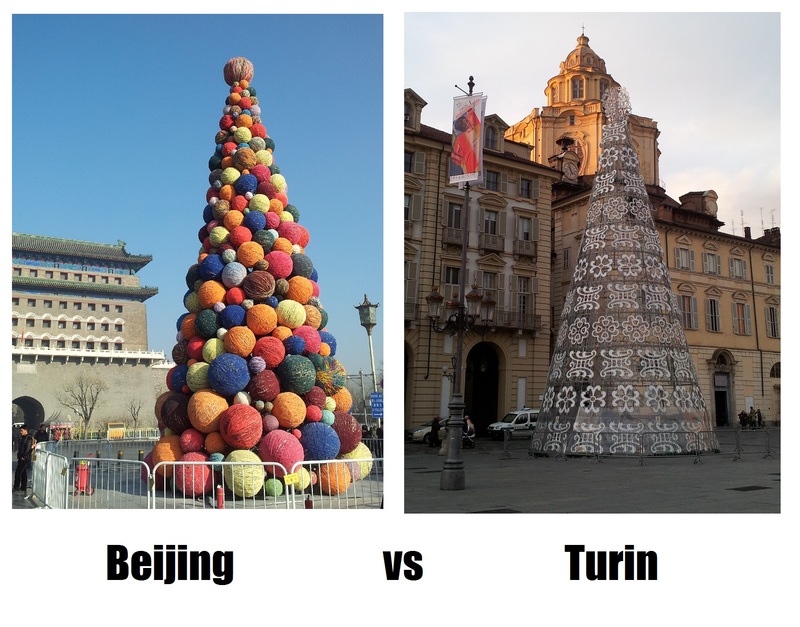 Points off for Turin for only being colourful while lit up at night. Practical info for future reference: When I went through immigration, every line was long and slow except the 72-hour visa-free desk which had no queue at all. Score! Make sure you have info on both your arrival and onward flights. From Beijing airport, the Airport Express takes about 30 mins to get to Dongzhimen subway station and costs ¥25. From there, the subway is a great way to get around — clean, cheap (around ¥3 for a single trip) and has plenty of English signage, including all station names. I stayed at the Peking Yard Hostel, cost was ¥80 for a dorm bed (plus ¥100 refundable deposit) and I would stay there again. I ran into some problems getting cash because my Italian card isn’t very international-atm-friendly and I didn’t have the PIN for my Australian card at the time, but I did eventually manage to use my Italian bank card at an ICBC atm. You definitely need cash to get around. Not sure “it looks like Milan!” is a good thing to say about a city’s air quality, and how it looks probably isn’t much of an indication of how toxic it is, anyway. But for a very short visit, it was easy to deal with. 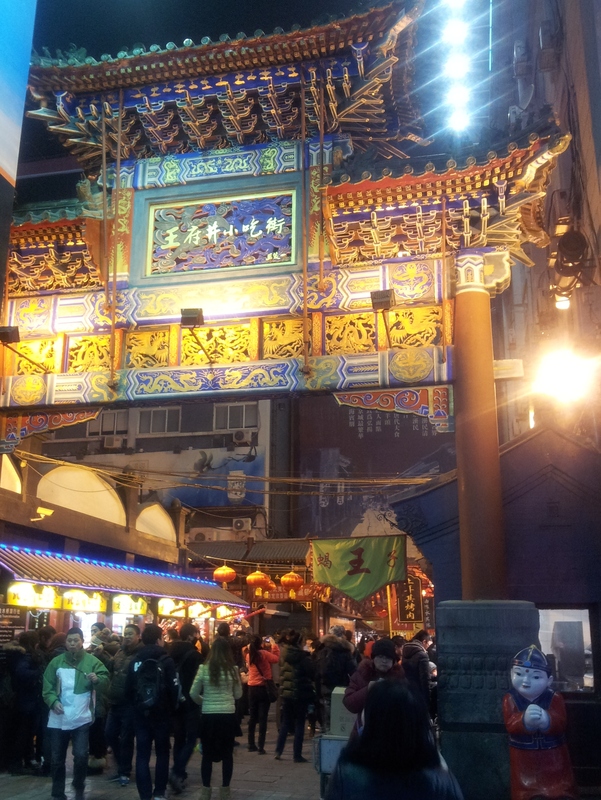 This entry was posted in China and tagged beijing, dumplings, food, layover, market, park, street food, temple, travel, visa on January 25, 2015 by Where's Zoe Now?. Whoa!! This sounds and looks amazing. Great post!